For our final advent calendar ornament of this year, we are staying at home in the States. Christmas is a probably the biggest holiday of the year in the US. There are lots of different Christmas traditions throughout the country, but Santa Claus and his elves are a mainstay. Santa lives in the North Pole with Mrs. Claus, his elves and reindeer. The elves work all year making toys, while Santa keeps an eye on who’s been naughty and who’s been nice. On Christmas Eve, families hang stockings, traditionally over the fireplace, for Santa to fill. Bad children fear receiving a stocking full of coal. They also leave out milk and cookies for Santa and carrots for the reindeer. Santa travels the world on Christmas Eve in his sleigh pulled by the flying reindeer (though in Hawaii he travels by outrigger canoe pulled by dolphins), slides down each chimney and magically delivers presents to each good child. 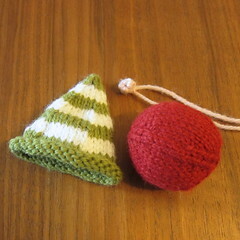 For our ornament, we are knitting up a Christmas ball to look like an elf. This is an easy, little knit though it does require knowing how to knit on double-pointed needles. (You could probably also do magic circle on circular needles, but I am more comfortable with double-points.) It is also a great stash buster as you don’t need much of any one color. Gauge: My gauge was 7 stitches per inch. 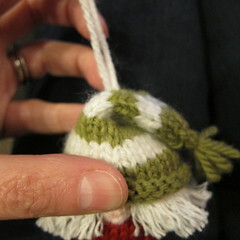 Gauge is not super important here, but make sure to knit the ball and the hat at the same gauge so the hat will fit. You also want the “fabric” you knit to be tight enough that the stuffing doesn’t show through. Cast on 12 stitches, make sure to leave about a 6 inch tail. Divide between 3 needles. Join together to knit in the round being careful not to twist. 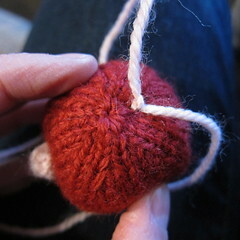 Place a stitch marker between the first and last stitch. At this point, put the cast on tail on a tapestry needle. Reweave through the cast on stitches. Pull tight to close the hole. Bring the tail inside and secure with a knot. Cut the yarn leaving a 10″ tail. Put the tail on a tapestry needle and put through the stitches on the needles. 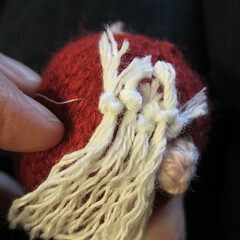 Take the stitches off the needles and use the hole to stuff the ball. Stuff it pretty tight, shaping as you go. Pull the tail to close up the hole. Secure. Cast on 32 stitches. Divide between 3 needles. Join together to knit in the round being careful not to twist. 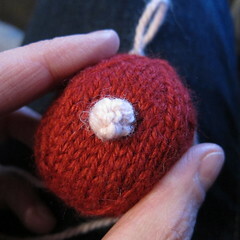 Place a stitch marker between the first and last stitch. Cut the yarn leaving a tail. Put the tail on a tapestry needle and reweave through the stitches on the needles. Remove the needles. Pull the the tail to tighten and secure it. With the pink yarn cast on 2 stitches leaving about a 6″ tail. Cut the yarn leaving about a 6″ tail. Put the tail on a tapestry needle and reweave through the stitches on the needle. Take the stitches off the needle. Tie the two tails together into a knot, pulling the sides together. Knot again. 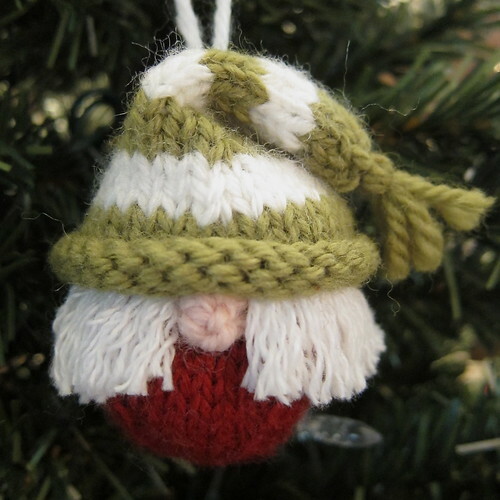 You should have a little bobble, though you may need to shape it a bit. Do not cut off the tails. You want the nose to hit right at the brim of the hat, so try on the hat and figure out that spot. With a tapestry needle sew the nose into place using the tails. 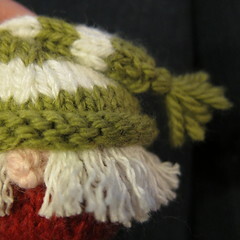 You just pull the tail through the ball, sightly to the top where they will be hidden under the hat. Tie into a knot to secure. 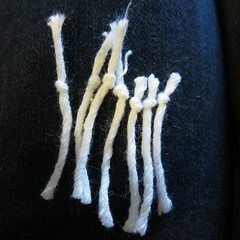 Cut lengths of the white cotton yarn, about 1 1/2″ – 2″. Tie a knot in one end. Don’t worry if the lengths aren’t exact, you’ll trim them later. 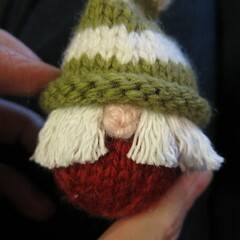 Using thread and a hand sewing needle, sew the pieces around the the ball just above the nose. (You want the knots to be hidden under the hat.) Sew through the knots and put them right next to each other. You can sew around a second time if you want them even more secure, but since they are under the hat it isn’t a huge deal. Put the hat in place over the hair knots. Sew into place just below the knots. Even though you are using thread that matched the green of the hat, it will look best if you sew where it will be hidden by the roll in the brim. Use the tapestry needle or comb to unwind the hair. Trim to desired length. If you want you can add a little tassel to the end of the hat. Then sew the hat so it folds down. Cut enough white yarn to make a hanging loop. 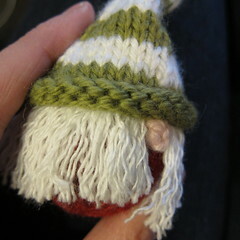 Use the tapestry needles to bring both ends of the yarn inside the bend of the hat. Tie them into a knot and trim ends. The knit will be hidden in the bend. Do not copy for distribution, repost, sell or teach this pattern without permission. You make repost a picture from it and link to the post. I love this. It is so cute. Great set of ornaments. Thanks for the wonderful projects! I hope you’ll do it again next year! Thanks so much Kat for this project idea and instructions. It reminded me of a long forgotten project tat I started many years ago. I purchased a set off books “Christmas Around The world”. Each book was about the celebration of Christmas in one country around the world; for each country two or more special crafts were highlighted. Instructions and patterns were given for the highlighted crafts, along with the crafting tradition, songs, stories, recipes, a handmade decoration, etc. I always thought that one day, I would make at least one craft item from each book, a recipe and decorations for my family to enjoy as a part of a family tradition to pass down to younger generations. Needless to say, I never got the project finished. finished. But I did keep I kept some of the items I did make, a few of the ornaments (which have become part of our family’s Xmas tree decorations. 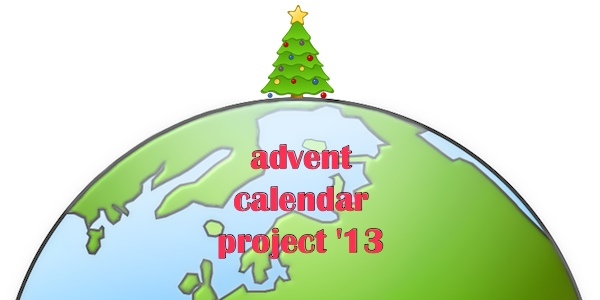 This project has encouraged me try it again, using your ideas.